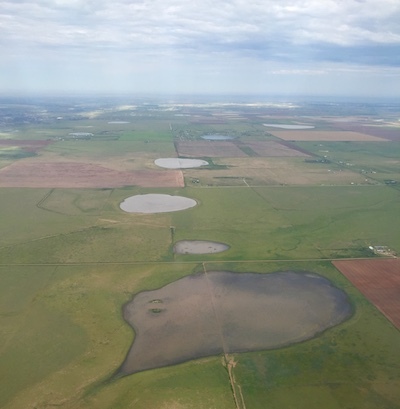 Earlier this year, conservation partners launched a Texas Playa Conservation Initiative with partner meetings in Amarillo and Lubbock to discuss how to increase playa conservation efforts in the Texas Panhandle. Participants included representatives from Texas Parks and Wildlife Department (TPWD), Playa Lakes Joint Venture, Ducks Unlimited, Natural Resources Conservation Service (NRCS), US Fish and Wildlife Service, Texas Agricultural Land Trust, Texas Grazing Lands Coalition, Texas Tech University, and The Nature Conservancy; in addition, Texas A&M AgriLife Extension recently joined the effort. The goal of this multi-partner effort is to restore playas throughout the Texas Panhandle to improve wetland habitat for migratory waterfowl, shorebirds and cranes, as well as upland game birds. Because playa restoration is a relatively new practice in the Panhandle, the partners are launching a two-year pilot project that will fill playa pits to restore their hydrological and ecological functionality in two counties while developing best practices for program delivery and scalability to other counties. The restoration work will focus exclusively on filling pits and trenches in buffered playas — those in native grassland or enrolled in the Conservation Reserve Program. During the pilot phase of the Initiative, the partners will also seek to better understand landowners’ attitudes about playas and what will motivate them to fill pits, and then develop a communications plan to inform landowners about the importance of playas and the need for restoration. “We have copied successful attributes of other locally-based conservation programs,” says Tarrant, “and are dedicated to keeping this Initiative simple and flexible in order to best meet landowner needs. The local playa conservation delivery teams, which will include representatives from NRCS, AgriLife and TPWD, will be talking to landowners in order to find playa conservation approaches that support the landowners bottom-line while improving wildlife habitat. Following the two-year pilot phase, the partners will launch a five-year implementation phase aimed at increasing the scope and scale of playa restoration in Texas.